How long until I see weight loss results? This iron rich meal is a fantastic choice if your energy levels are slumping a little, with crisp and fresh green vegetables and lean beef. With all the flavours we adore- ginger, garlic, peanut oil, and chilli, this is sure to be a winner at the dinner table. Cooks in minutes in the wok, easy prep, and is great as leftovers for lunch the next day. Method: 1: Whisk cornflour and soy sauce together until combined and smooth, then stir in chilli sauce, black bean sauce, and chicken stock. 2: Heat up a wok over medium-high heat, and pour in 1 tablespoon of peanut oil, coating the pan. Divide beef into 4, and cook each batch for 1-2 minutes until browned, removing from the pan and placing aside after each batch. 3: Add soba noodles to a pot of boiling water and cook for a few minutes until soft. Drain, and rinse with cold water. Set aside. 4: Add remaining ½ tablespoon oil to the wok, and heat. Stir fry the onion for 2 mins until soft, and then add green beans and broccoli. Add brown onion. Stir-fry for 2 minutes or until softened. Add garlic and ginger. 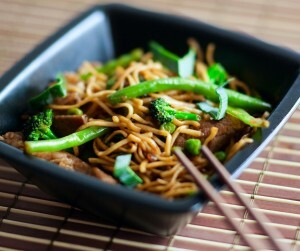 Stir-fry for 3 to 4 minutes or until vegetables are just tender. 5: Return beef and juices to wok with the vegetables, then pour in sauce mixture. Stir-fry for 2 to 3 minutes or until sauce boils and thickens. Add spring onion and soba noodles and cook for 1-2 mins, tossing to combine.